A tireless member of Little League for 29 years, Sheila worked hard year around to give the children of Tucson and Pima County an opportunity to play the game that she loved so much. She was the “heart of Little League” and a lasting example of community involvement and volunteerism. 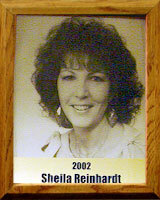 Sheila served on many Little League boards and officiated at all-star tournaments. Sheila, a District 12 administrator, was instrumental in the development of the newest league in Tucson. She has had a direct effect on the hundreds of children in Southwestern Little League and on thousands of others in District 12. Sahuaro’s Little League Field at Palo Verde Park, where she spent so much of her time, was renamed Sheila Reinhardt Field in her memory.